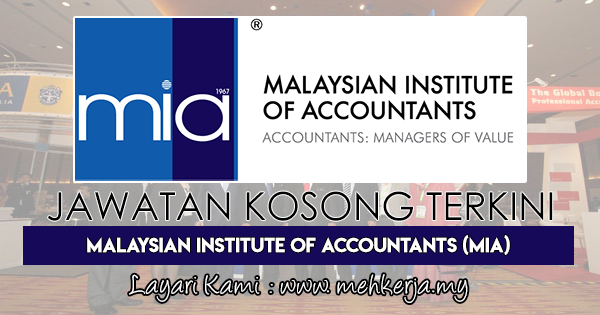 The Malaysian Institute of Accountants (MIA) is a statutory body responsible to regulate and develop the accountancy profession in Malaysia. It is the sole organisation in Malaysia with the right to determine whether or not a person is qualified to be recognised as an accountant by virtue of the power provided by the Accountants Act, 1967. MIA is a statutory body established under the Accountants Act, 1967 to regulate and develop the accountancy profession in Malaysia. To date, MIA has 32324 members. MIA's responsibilities include education and quality assurance as well as enforcement which are carried out to ensure that the credibility of the profession is maintained and that public interest is continuously upheld. 0 Response to "Jawatan Kosong Terkini di Malaysian Institute of Accountants (MIA) - 28 Feb 2019"